Have you ever wanted certain results in your life and didn’t know how to go about proceeding? That’s where this is an excellent process you can apply in your life to get the kind of results you would like. These three steps are like a blueprint for getting results. Although the steps are simple in theory, there can be a lot of nuances to the process and you may find the process challenging at first. An intention can be anything you are intending to become, accomplish, experience, or have, whether it be a more healthy relationship with someone else (or yourself), a better financial situation, starting a business, create a life you love, finding the person of your dreams, etc. You can view the process of getting the results you desire in life and business like a roadmap or even like a river. Before you leave on a trip, there is a destination you have in mind, which is your intention. Realizing your goal/intention will depend on the duration you hold your intention in your mind and the emotional state you experience while you are focussed on your intention. The duration that you focus on your intention is a key factor to realizing your goal. You could focus on your goal for 1-2 minutes every day and you will reach it a lot faster than if you only focussed on it for 1-2 minutes for only 1 day in a month. The more you think about your goal/intention, the more you will drive it into your subconscious and that is where the real power comes from. The next step is all about the emotions (and emotional intensity) you experience when thinking about your intention and also in your everyday life. State can be worded many different ways such as: emotion, emotional intensity, energy, energetic state, consciousness, level of consciousness, etc. Your state will determine your results not only for your goal, it will affect all areas of your life positively or negatively. 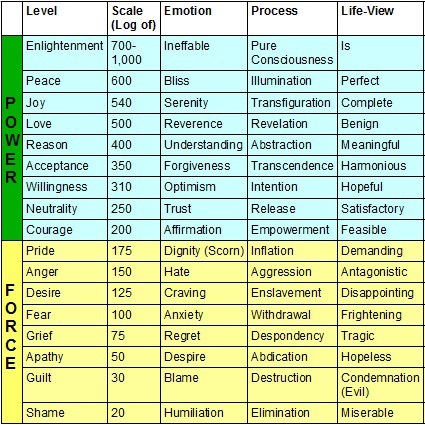 Your job is to become more aware of your state and where it is at on the state chart as shown in the link above. States below 100 on the chart are stuck states. You will not reach your goals if you are perpetually below an energetic level of 100. To accomplish anything, your state must be above 100. Although you will see collateral damage in areas of your life if you are operating in a state between 100-200. You may get a lot more done here, yet you will create drama and damage in you life in these lower states. To experience positive growth and results in your life and to be able to move faster toward your goals, being in a state above 200 is crucial to success. If you can simply bring yourself to an energetic level of 200, it will be easier to climb to higher states where the real power to create anything you want in life is possible. You may even find that as you find yourself in a state of neutrality or higher, your intention is more easily realized. You might even realize that the dream or goal you were holding on to might not have even been your goal. It may have been someone else’s goal or dream and you can now let it go and figure out what goals and dreams are true for you. Making a habit of practicing awareness of your state can really transform your life for the better. This is where the rubber meets the road. The power with which you take action all hinges on your state and how long you’re holding your intention in your mind. If you are taking action on a regular basis with your intention in mind, while feeling really good, you not only can accomplish anything, you will reach your goals faster and more effortlessly. My suggestion is to have a core intention that is bigger than yourself, that drives you daily into action toward it. You can have smaller marker goals along your path that you will reach along the way. Ultimately, it’s the big dream goal that is pulling you toward it and you will find it much easier to take positive action toward each goal along the way. As you take appropriate action toward reaching your goal, make sure to be aware of the state with which you take action from. If you are in a lower state, your holding yourself back. To catapult yourself faster toward your goals, do your best to be in an energetic state higher than 200 while you are taking action. As you continue to apply these three step in all areas of your life and business, you will see positive growth and positive change in your life and business. For more information on the subject I highly recommend purchasing the book: Power Vs. Force by David R Hawkins. If you enjoyed this article, please hit the like button and/or one of the share options below. You can also share your thoughts in a comment below. Thanks for reading. The Teachability Index – Start Here First! Great post, William. Loved the scale and the reminder how important it is to have all three of these elements combines – intention, state and action – in order to succeed. I am happy to say that I am hanging out around 400 to 500 although I still have days that I found myself feeling stuck in inaction. This is a great illustration of how powerful mindset is and how we can shift our energy so that we can continue to grow. Thanks for sharing this today! Nice to hear you’re hanging out in the higher states Minette. Thank you for your comment. You found this post fast Heather! Thanks for posting. I would highly recommend attending the Abundant Living Retreat to anyone reading this. The experience has dramatically changed my life for the better. This post is a small glimpse into what is available to you at the Retreat. Very interesting table – I think I self-assess myself at around “Wilingness”? – I hope so! How do you figure it out and how can you get yourself higher up the table? Nice to hear you’re above 200! To assess yourself, you may wish to learn how to do a ‘muscle test’. A self test can be tricky. I find it easier to have someone else do the test. You can likely find info online and some YouTube video’s on the subject. To raise your state higher, it’s good to clear yourself of inner conflict as best you can as it arises. Being aware of your state is a great start in being able to raise your state. When you check in or notice when your state has dropped, you might see if you can find courage or neutrality with whatever is going on in the moment. If you can find neutrality with whatever you’re dealing with, willingness, acceptance and understanding are not far off. Always be gentle with yourself if you find yourself below 200. Just being okay with where you are at can bring your right to courage and neutrality. Hope this helps answer your questions.